This is Benn’s second novel, the follow up to Terra, and it’s far better than his first. The ending of his previous book was a little weak, but this one has no weaknesses at all. It’s well plotted, introduces a couple of new characters and has a very good plot. Above all, it has Mitch Benn’s brand of humour which is always worth a smirk or two. 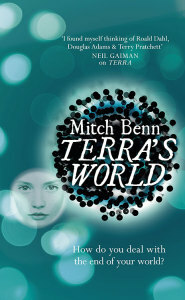 Terra was brought up on the alien world of Fnrr for over a decade and was returned home at the end of the last book. She’s spent the past two years being shunted, with her parents, from place to place as several alien bounty hunters have tried to track her down and kidnap her. Terra’s had enough. She manages to steal one bounty hunter’s ship, takes with her a friend called Billy and they both try to work out why Terra hasn’t heard from Fnrr for a long time. The answer has to do with politics, religion and a lunatic who thinks he’s the reincarnation of a long dead leader. There’s also the planetary computer, the Extroplator, which is as arrogant and self-important as Sheldon Cooper. Sorry, DOCTOR Sheldon Cooper. Add to this a warlike race that would put the Klingons to shame, a planet killer that thinks it’s doing everyone a favour by killing them and enough advanced technology to give a geek wet dreams for a decade and you have the makings of an entertaining book. 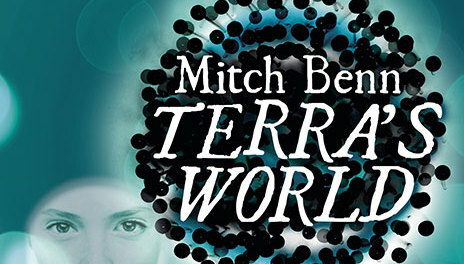 Benn has created a nicely detailed universe. Fnrr is an advanced planet peopled by a species with big eyes, no hair and grey skin. The nation that Terra grew up in, Mlml (they haven’t worked out what vowels are), is full of innocent-minded people who don’t know what a lie is and think that everyone tells them the truth. This gives hope to one downtrodden cleaner who has learnt how to lie and gain power as the Gfjk-Hhh. Lbbp, Terra’s stepfather, has been imprisoned and redesignated as the deceiver, the one who gave Gfjk the idea of lying, which is one reason Terra hasn’t heard from him. Other reasons are that the communications on the planet have been hit a by virus that keeps it in a program loop and the people of Mlml are in thrall to the man they believe is their spiritual and political leader. He’s banned technology and rules by cruel whim. Billy, along for the ride, loves SF and has to tell his SF loving father that he’s off to another world with Terra and can he please tell mum and school about that. On the face of it, this seems to be a thread of unlikeliness. Not so. Terra returned to Earth in a blaze of publicity and two humans, one military one scientific, returned with Lbbp to Fnrr for the purposes of diplomacy and culture. Telling the authorities is not going to raise too many eyebrows, especially as Terra’s human parents know she’s gone back to Fnrr. When the two of them get to Fnrr, they team up with Terra’s old classmates to try and save the world by removing the Gfjk and destroying the planet killer. Benn’s style is easy on the reader, but don’t let that fool you into thinking it’s a simple book. This is as much a satire as anything else, taking apart organised religion and machine politics, a thread runs throughout the book. Anyone who’s heard Mitch Benn on Radio 4’s weekly satirical program, The Now Show, will not be surprised by this. It has more depth than it seems at first sight and has passages and scenes, some of them uncomfortable, that stick with you long after you’ve put it down. It’s an excellent book that I would recommend to anyone.